Interior lighting is often an afterthought during the building or renovation of a home. It doesn’t matter if you have the most beautiful home design, if the lighting is insufficient, your home will never reach it’s full potential. If you are preparing to sell your home, this is a good time to take a look at the interior lighting fixtures throughout the house. Home buyers are very savvy and sophisticated in their taste these days, and a house filled with out-dated fixtures may cause them to rethink your home. Installing modern lighting fixtures is one of the most cost effective facelifts you can give your home. Natural lighting is really important, as well. If you are home staging, you'll want to flood your home with as much natural light as possible, by opening (or removing!) window treatments in every room. Buyers respond positively to a well-lit house, and a good balance of natural and interior lighting will add value to your home, meaning more money in your pocket. When planning the interior lighting for your home, you should first consider the purpose of each room. Think about function, form, balance, and the atmosphere you wish to create. Some rooms are multi-functional and the right fixtures for each zone should be planned. In addition to function, the light fixtures you choose should be decorative as well, enhancing the style of your home. Ambient lighting is a general, evenly distributed source of light that brightens up an entire room. Examples of ambient light are; natural light, ceiling fixtures, floor and table lamps, and indirect recessed or cove lighting. Ambient lighting allows people to move around a space safely and comfortably in the dark. The amount of ambient light you need depends on what kind of mood you are trying to create and the style of the room. Interior lighting should always compliment your home design. Recessed lighting fixtures - This form of contemporary lighting is a good choice for low ceilings. Because the fixtures are recessed into the ceiling, they aren't taking up space by protruding into the room. This makes a ceiling seem higher! Recessed lighting, also known as "pot or can lighting", is suitable for almost every style of home decor, and lends a clean, contemporary look to your home. If you have the old clunky floodlight style of recessed lighting, consider replacing them with smaller halogen style, which looks much more sophisticated and subtle. The downside...recessed fixtures are expensive to install, often requiring demolition and replastering. Talk to a lighting expert before you start putting holes in your ceiling. 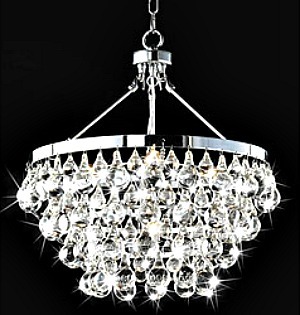 Chandelier lighting - Gone are the days of the ostentatious, greatly embellished, and chronically dusty chandeliers! 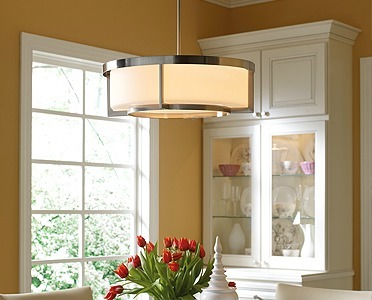 Todays' modern chandeliers have a fresh new look that will fit in almost any interior home decor. Chandeliers are typically seen in a dining room or foyer, but these days, are showing up as a decorative focal point in any room. Chandeliers are now in bathrooms, bedrooms, over kitchen islands, and even laundry rooms. 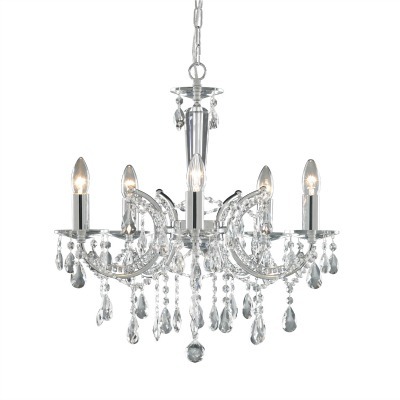 Crystal chandeliers will effectively add drama and sparkle anywhere in your home interior design. Because chandeliers are more about ambience, they don't offer very good overhead lighting, due to the fact that most of them direct their light upward instead of down. Adding clip-on shades is a solution for some styles that'll help direct light downward. Select shades in a light neutral colors if you are home staging. Cove lighting - Cove lighting is ideal for showcasing deep moldings or other interesting details on your ceiling. Cove lighting is built into the recesses, ledges, and valences in a ceiling. Or it can be placed high up on walls. Cove lighting focuses light upward, towards the ceiling, and down the walls. It is typically used to highlight decorative details of the ceiling, but may be used as the main lighting of a room, as well. One example is rope lighting, which is often strung inside a built-in ledge around the top of a room for ambiance. Torcheres - A torcheres is a floor lamp that focuses light toward the ceiling. Torchere lamps bounce light off the ceiling and back down into the room. They work best in pairs to balance light and add symmetry to a room. Torcheres function well in rooms that lack overhead lighting. A torcheres will create shadows in the room which can be brightened by using other forms of lighting, such as a table lamp. The downside; if your ceilings are in bad shape, a torchere lamp will emphasize every flaw! Task lighting is a focused light directed toward a specific spot in a room to help with reading or working. Task lighting should be strong enough (but not blinding!) for people to work efficiently without straining their eyes. You will find examples of task lighting in kitchens in the form of under cabinet lighting, pendants over kitchen islands, and reading lamps next to beds, chairs, and desks. Track lighting - Track lighting is a series of light fixtures attached to a track. They're available in a variety of styles and lengths, and the bulbs can be directed toward the particular area you want to focus on. 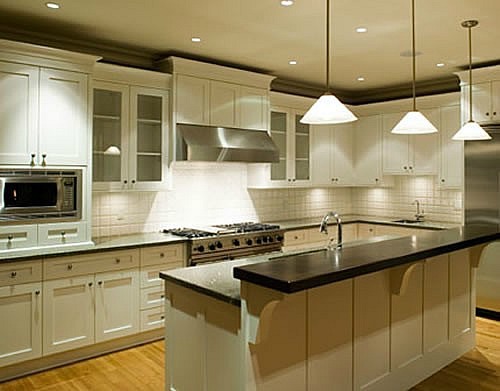 Track lighting fixtures are commonly seen in kitchens over an island, in workplaces, or above artwork. This form of lighting can serve as ambient lighting as well, works in every room of the house, and with most interior design styles. Track lighting fixtures with the clunky “big can” attachments are really outdated, so you may want to replace them with smaller halogen spots, especially if you're trying to make a home sale. This will save energy as well. Pendant lighting - Pendant lights are fixtures that hang in a straight line from the ceiling on a chain, a metal rod, or cord. They are most often seen above kitchen islands, bathrooms, on each side of a bed, and sometimes in a corner nook over a favorite reading chair. Pendants are usually hung in pairs and are available in a multitude of attractive colors, materials and styles. 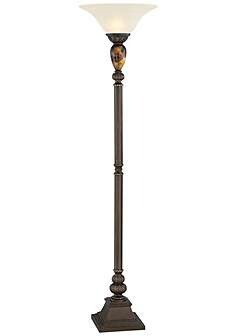 Floor lamps - Floor, or standing lamps, are designed for task lighting. They shine their light down or sideways toward a certain area. Floor lamps work well next to chairs, behind sofas and are available in a multitude of styles to fit any home decor. Table lamps - Table lamps are the most common form of task lighting-- everyone has at least one. They provide light for reading, sewing, etc., and are a necessity next to every bed.They are also very decorative and serve as accent pieces throughout the house, making them a functional accessory. 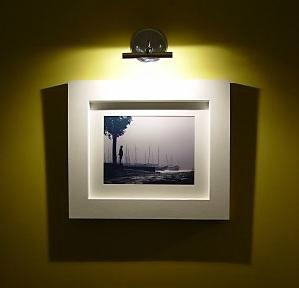 The purpose of accent lighting is to draw attention to a certain area or detail, such as a piece of artwork on a wall. You can also find accent lights highlighting a spectacular cove ceiling, collections, bookcases or trees and shrubbery outside. Accent lights can also be used to add drama and create atmosphere in a room. Wall sconce lighting - Sconces, as pictured right, are subtle, elegant fixtures attached to a wall. They can focus light upward, down, or both directions at once. You often see sconces hung in pairs, for example, one on each side of a fireplace, bed or piece of hanging artwork. They're useful in illuminating dark hallways, entryways and adding symmetry to a room. Wall sconce lighting can be decorative as well as functional. The downside of wall sconces; They can highlight any flaws you may have on a wall. Picture lighting fixtures - Picture lighting fixtures are used to accent artwork. They're typically attached to the top of a picture frame or above the artwork to highlight the subject. Accent lighting is also used over or under shelves, behind artwork, or even below it, like a spotlight shining on a statue. Natural light is the most preferred form of lighting in home interior design. Natural light makes everyone feel good by infusing a room with sunny warmth and a feeling of spaciousness. It has the effect of making small spaces appear larger too. When you're preparing your home for the real estate market, you should focus attention on the window treatments in each room. Are the windows in your home shrouded in dark heavy draperies? Are window blinds hiding a beautiful view that home buyers might miss seeing? Your goal is to let in as much natural light as possible. Pull back draperies, wash windows until they sparkle, remove screens and open the blinds. 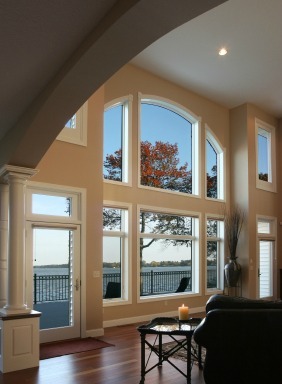 If you have a spectacular window with a great view, as in the picture to the right, leave it bare of window treatments. Allowing maximum natural light in will make the space seem more open by extending the room into the outdoors. Each room in your home will have different lighting needs. When selecting fixtures for your rooms, you will need to assess the size of each room, the function, and how much natural light is coming in. Kitchen - Overhead lighting works well for overall or ambient lighting in the kitchen, but task lighting should be added to make the kitchen safe and bright enough for food preparation. Task lighting under kitchen cabinets and over the sink and stove will make kitchen chores easier and more pleasant to perform. 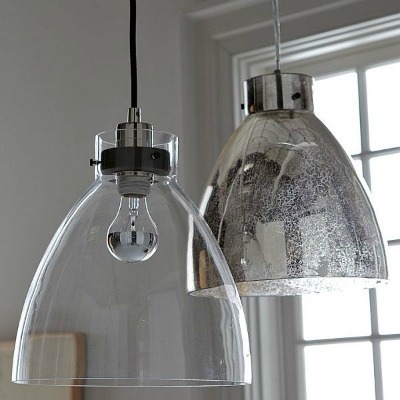 A track, pendants, even a chandelier, will work well over a kitchen island, adding brightness, beauty and style. Bathroom - This is a busy room where lighting must function well. In small bathrooms, a single overhead fixture may provide ample lighting, but typically, you want to avoid having one glaring lightbulb. The formula for a shadow-free reflection in the mirror is to combine overhead lighting and a fixture on each side of the mirror. Lights in the shower and/or bathtub are a luxury, and not always needed if the overall bathroom lighting is sufficient. Windowless bathrooms would benefit from the addition of a skylight to let natural light in. The light fixture in the picture above is a perfect example of what NOT to do!! This is what I found waiting for me in my last home. It's so funny, I just had to share it! Living room - This room requires enough overall ambient lighting to make it comfortable on the eyes. Typically, the living room is a multi-task area that requires task lighting for activities like reading, and accent lighting to call attention to artwork and other focal points. Dining room - This is the obvious choice for a “showstopping” light fixture. If the fixture is off-center in the room, swag the chain over with a cup hook to put it in the right place. See staging the dining room. A beautiful chandelier will make your table settings sparkle and gleam, and serve as a focal point in your dining area. Bedroom - Bedrooms should have bedside task lighting for reading and enough ambient light for getting dressed. Front entry or Foyer - This is your chance to impress buyers as they enter your home! Depending on the size of your foyer and height of the ceiling, this area is an excellent candidate for hanging a dramatic lighting fixture that will serve as a beautiful focal point. The foyer should be bright, warm, and welcoming for visitors. Closet - Closets shouldn't be cavities of darkness-- they should be well-lit so you don't find yourself wearing mismatched shoes when you get to work. Install at least one lighting fixture, or stick a few affordable battery-operated puck lights inside for illumination. You can find inexpensive "stick on" puck lights at any home supply center. Hallway and stairs - Adequate lighting is needed in these areas for safety reasons. Stairs are ideal areas for wall sconces. Recessed and wall sconce lighting work well in dark hallways. Be sure that wall sconces are high enough that you don't bump into them as you pass through. Basement - Basements are typically dark and gloomy because of small windows. Although ambient lighting is beneficial, natural light is simply the best form of light in a basement. If you have puny windows, you might consider enlarging them to bring in more natural light. Dimmer switches give you the flexibility to create a variety of moods for your different needs. Light dimmers in a dining room can create an intimate atmosphere; in a family or media room, you will be able to make a snack run without stumbling in the dark. Cool light - Cool light is not the most flattering color for complexions; it has a blueish tinge and can make people look tired and wan. Cool light should be used in a room that you want to be restful, like a bedroom. Warm light - Warm light has a yellowish tinge and creates a comfortable or intimate setting. Use this type of light in rooms where socializing will occur. Natural light - Is a good mood enhancer, helpful in creating positive energy and activity. Natural light will also give you more pep and ease depression. I live in Alaska where the winters are long, cold, and dark. Many of us suffer from “cabin fever” until March. As spring nears (with more daylight) we feel a renewed energy. Soft lighting - Low soft light in warm colors will camouflage flaws and details and create an intimate atmosphere. Used in the wrong setting, soft lighting can make a room bleak and depressing. Plenty of natural and artificial light are key elements for opening up space in small spaces. Open the drapes or curtains to allow as much natural light as possible to flow into each room. One glaring overhead light fixture can dominate a room, drawing the eye to that one spot. Apply more than one source of light to keep the eye from fixating. For small bedrooms, mount wall sconce lighting fixtures on the wall on each side of the bed. 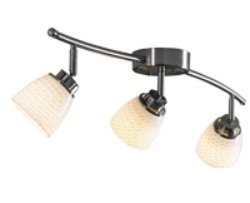 The most practical task lighting fixtures for reading in bed are swing-arm wall lights. Another option for a small bedroom is to hang a pendent lighting fixture from the ceiling on each side of the bed. Be sure to hang them low enough that you can turn them off while lying in bed. Home buyers love recessed lighting! 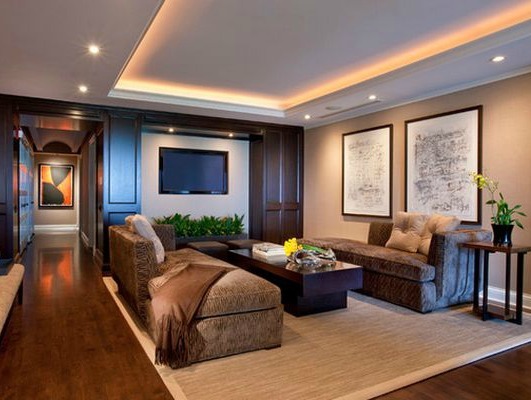 Recessed lighting is the answer for low ceilings and small spaces, because they are, well…recessed into the ceiling. There is such a thing as TOO MUCH LIGHT! If you have floor to ceiling south-facing windows that let in too much midday heat, you should cover them with shades or blinds so home buyers feel comfortable in your home at any time of the day. When showing your house to prospective buyers, turn on every single light to brighten your home. To minimize glare, swap out clear bulbs with frosted ones. Every average-sized room should have a least three light sources. Mirrors are a wonderful designing tool for bouncing and reflecting light around a room. Place a mirror where it reflects an outdoor view or a lovely lighting fixture. Mirrors will add extra dimension and the feeling of spaciousness as well. Use bulbs of the same color in a room to avoid color inconsistencies of your floor, furniture, and accessories. Use up-lights (torcheres) to create drama on the ceiling. Aim accent lights toward focal points, objects, or interesting architectural features that you would like to emphasize. Remove heavy and dark window treatments to bring more natural light into a room. Watch out for “black holes” in a room due to scanty lighting in that part of the room. Dark unlit corners of any space can make a room feel smaller. 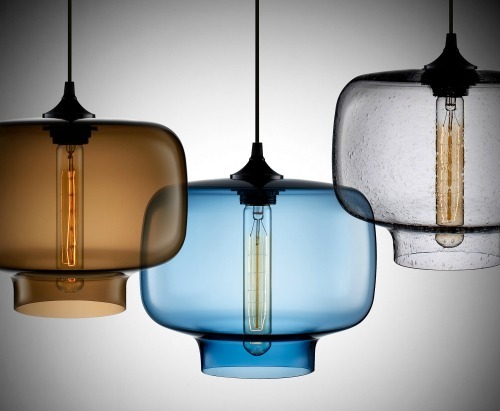 It can be often be confusing choosing the right lampshade for a lamp base. 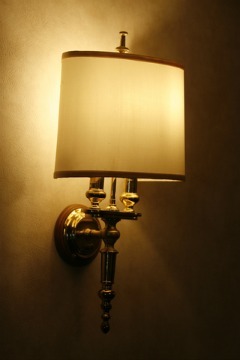 For tips on selecting lampshades, go to www.lampsusa.com. 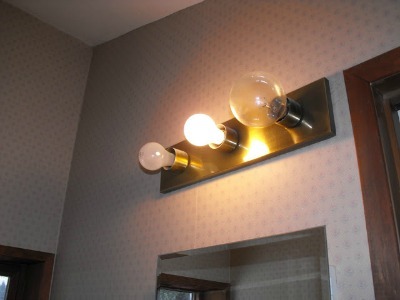 For information on selecting the right kind of lightbulbs for your fixtures, go to www.thomaslighting.com. For tips on exterior lighting go to outdoor lighting. Return from lighting to home page.